Dario was born in the Southern African country of Mozambique. During the subsequent war, he was forced to take up arms. 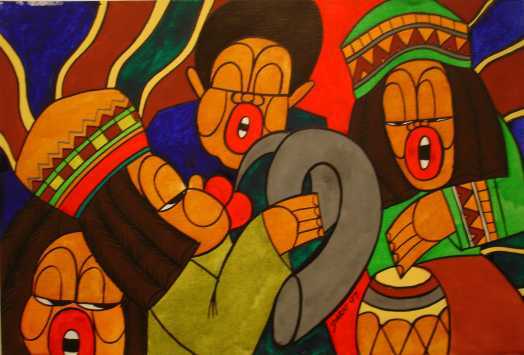 He fled Mozambique to South Africa, choosing to take up his dream of becoming a renown artist. He met up with Elias Sewape who already was a household name and was taken under Elias' wing. Dario's work is influenced by greats such as Azimo and Malongatoni but there is no doubt as to his own unique and interplay of vibrant colors. Dario has since participated in numerous exhibitions internationally as well as nationally with works being displayed in both Europe and the U.S.A.. He was recently crowned the "young artist today" out of a field of thousands He was also responsible for the logo for the international media giant M-Net and was invited to decorate both the Soweto and Alexandra Township cricket ovals for their historic first international matches against Australia.